To celebrate South Africa’s rich ocean heritage, the South African National Biodiversity Institute (SANBI), in collaboration with the Department of Environmental Affairs, the Department of Science and Technology and other partners, have launched a new website. The website showcases the network of proposed new Marine Protected Areas gazetted for public comments in February 2016, allowing the people of South Africa to meet these special ocean areas. Even scientists have been surprised by some of the deep discoveries in the research work that underpins this initiative. The website will soon include a short film which will present beautiful, never seen before footage from several of these areas. Marine Protected Areas (MPAs) are parts of our coastline and open oceans that are specially protected for the benefit of people and nature. They help manage part of the marine environment to promote fisheries sustainability by keeping marine ecosystems healthy and protecting the species that depend on them for survival. Having healthy ecosystems enhances our resilience to climate change and ensures that we continue to benefit from the large number of tourists that flock to South Africa to experience the unique ocean wildlife of Mzansi. SANBI Chief Executive Officer Dr Moshibudi Rampedi noted that, ‘South Africa is strategically positioned with territory in three oceans; the Indian, the Atlantic and the Southern ocean and is the only country in the world that can contribute to the protection of life in all three oceans’. South Africa is the only African country with territory in the Southern Ocean, represented by the Prince Edward Islands and its vast ocean area some 2 500 km southeast of Cape Town. Nearer the continent, the mixing of warm, cold and even colder ocean waters interact with our unique underwater features to produce an incredible diversity of ecosystem types. Ecosystems range from the enchanting kelp forests that hug the west coast, to the cold water coral-encrusted seamounts on the south coast, and the submarine canyons and deep sea muds on our east coast. Imagery of these amazing ecosystems are shared on the new website. 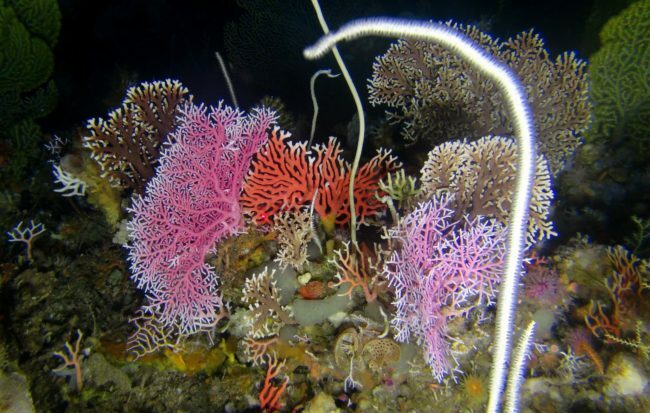 South Africa’s ‘underwater fynbos’ is introduced; these unique lace coral habitats off East London are found nowhere else on Earth and the film notes that deep water corals and sponges provide homes for seafood species, nursery areas for young fish and contain cancer-fighting compounds. The proposed new MPA network includes the first marine protection in Namaqualand, protection for South Africa’s ‘Grand Canyon’ and protection for threatened ecosystems and species such as turtles, sharks, seventy-four and red steenbras. Many of the photos and imagery shown on the website are from scientific collaboration with the Department of Science and Technology (DST) – National Research Foundation (NRF) funded African Coelacanth Ecosystem Programme (ACEP). Other scientific research projects that have made substantial contributions include the Department of Environmental Affairs (DEA) Benthic Ecology Programme and the NRF/South African Environmental Observation Network (SAEON) led Benthic Trawl Experiment. Scientists from DEA, SANBI, Ezemvelo KZN Wildlife, NRF/SAEON, NRF/South African Institute for Aquatic Biodiversity (SAIAB), South African National Parks, South African Association for Marine Biological Research (SAAMBR) and several universities have contributed. A short film called MzanSea was produced to share South Africa’s ocean diversity and will soon appear on the website. The film is directed by Dr Otto Whitehead who is currently registered in an innovative post-doctoral study that includes both research and science communication. In 2014, the South African Government launched Operation Phakisa, an initiative to develop our ocean economy. This involves the expansion of marine and coastal tourism, the development of harbours and ports, aquaculture, and offshore oil and gas. South Africa’s development path aims to grow the economy while accounting for sustainability and the need for healthy thriving oceans. To safeguard the current and future benefits from our oceans, South Africa is increasing the extent of our MPAs from 0.4% towards 5%. The website is the culmination of 12 years of marine biodiversity science and systematic planning. This work is an example of how foundational science is used to build knowledge to inform policy and action. Visit the website to see more about the research teams undertaking applied marine science in South Africa’s oceans. SANBI assesses, monitors and report on the state of marine biodiversity and this work is underpinned by mapping of marine ecosystems and their pressures. SANBI led the five-year Offshore Marine Protected Area Project, which along with provincial and sector-specific spatial planning, supported the development of this proposed network. The website is a celebration of this work, undertaken in collaboration with many South African scientists. SANBI’s Marine Programme manager Dr Kerry Sink commented on this work to support sustained ocean benefits through new MPAs saying, ‘it has been a privilege to support the exploration, conservation, sustainable use, appreciation and enjoyment of South Africa’s exceptional marine biodiversity’. Kerry Sink is also a research associate at the Centre for Coastal and Marine Research at Nelson Mandela University and passionate about growing the next generation of South African marine scientists. Follow SANBI on Twitter @SANBI_ZA with the hashtag #MzanSea.